A lot of people are asking us how to apply for a Schengen visa, what are the requirements, etc. In our previous trips, we applied for a Schengen visa at the Embassy of France; thus, most of the info I will share here are based on submitting the visa application at the Embassy of France. I hope that you'll find the following information useful. If you are holding a Philippine passport like me or you are a third world citizen, you definitely need a visa. If you intend to visit only one Schengen Member State, you must apply at the Embassy or Consulate of this Member State. If you intend to visit several Schengen countries, you must apply for a visa at the Embassy or Consulate of the country which is your main destination. If you intend to visit several Schengen countries but do not have a main destination, you should apply for a visa at the Embassy or Consulate of the country which is your first point of entry. In our previous trips, we applied for at the Embassy of France because Paris is our main destination and happens to be our point of entry also. You have to show your passport when applying. From experience, if you are travelling with your family (husband, wife or children), only one family member may show-up at the Embassy, usually the father or the mother. Separate application must be done for children even if they are on their parents’ passport. As of the 1st of January 2007, the visa administrative fees will be 60€ (transit, airport transit, short stay), which must be paid in Qatari riyal only. The fee is accorded to the exchange rate of the Qatari riyal against the Euro, so varies around 340 QR. The visa application is free of charge to Spouses and Children of European Union citizens, and to the holders of diplomatic, service and official passports. Please note that no fees will be refunded whatever the outcome of the visa application. You can submit the completed application form (you can download from the French Embassy site) with the required documents to the French Embassy between 8:30 AM to 10:30 AM. Tip: Be there preferably before 8:30 AM. Sometimes, the Embassy stops receiving applications even before 10:30 AM. I heard (not sure if true) that during summer, The French Embassy sets a daily quota due to the huge volume of applications received. Normally two weeks after submission of application. Tip: Allow sufficient time for processing and provide some allowance. The requirements may change over time. Double check the requirements, processing time, procedure from the Embassy where you are submitting your application. More info about Schengen visa here and here. Yap, this blog has a new domain name. We’re back since last Saturday. Walter and I had a great time in France and Italy with my college friend/classmate, Sheila and her mom. We were tired from miles and miles of walking but we enjoyed every moment of our trip. When we were planning the trip, Sheila chose a country where I haven’t been to – Italy. But I told her, she shouldn’t miss Paris and I wanted to go back anyway so the itinerary became Italy and Paris. I love France. 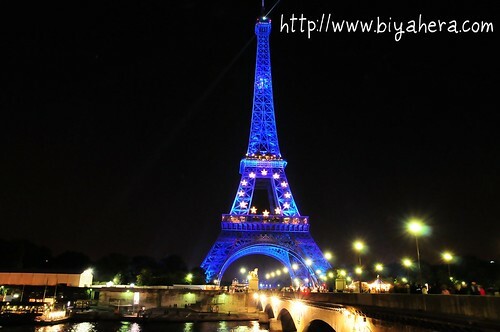 I love the romantic city Paris popularly called the city of lights. I will never get tired of going to Paris again and again. In fact, I dream of living in Paris even for just a few months. 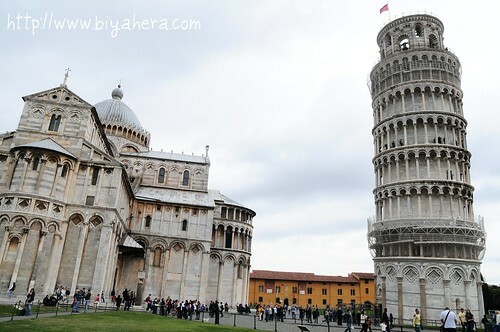 In Italy, we went to six major destination cities/towns including Florence, Siena, Pisa, Assisi, Rome and Vatican. We accumulated almost 8GB of photos (average of 3-5 MB per photo) excluding those taken from Sheila’s personal camera. I am done downloading the photos to my computer but I haven’t really sorted them. I also have some video footage though I was not able to cover the entire trip. It’s difficult to read guide books/maps, enjoy the sights, be cautious with your belongings and take videos at the same time - not to mention the herds of tourists around and maybe some pick-pockets. To enjoy our trip, I decided to just concentrate in sightseeing though I felt a little bit of regret not being able to take more videos like I did in 2oo6 and my own photos. I relied on my husband to take the photos because he is the better photographer between us and he has a better camera (Nikon D300 with different lenses, wide and zoom) but I felt I should have taken my own photos for blogging purposes. You know how other blogger share every detail of their trip including a photo of the bus stop or the ticket booth? I am afraid my blog entries will lack those details but definitely I will post many beautiful photos taken by my husband and I will share as much information as I could. Right now, I’m still quite overwhelmed with the loads of photos and information I’d like to share with you so for now, let me first give a preview of the cities/places we visited. Above is a night shot of Eiffel Tower, one of the famous sights in France. We were surprised that it has blue lighting now (it used to be gold) and it has the European Union's circle of gold stars. Walter and I went to the sights we haven't been to before. We also revisited some sights with Sheila and her mom. 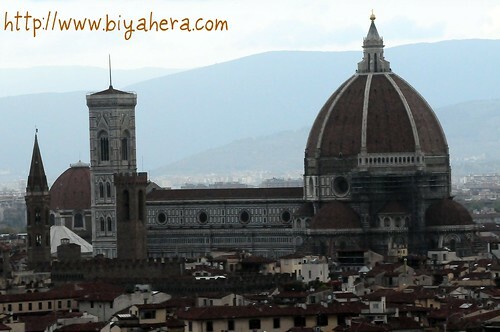 This is the Duomo (Santa Maria del Fiore) - Florence's Cathedral. Florence (Italian: Firenze, Old Italian: Fiorenza, Latin: Florentia), is the capital of Tuscany Region of Italy. It is the cultural capital of the world, home of renaissance and the birthplace of modern world. In Florence, we visited great museums, churches and monuments. Above is the Palazzo Pubblico located, in a square called Il Campo. Siena is a town in the Tuscany region. 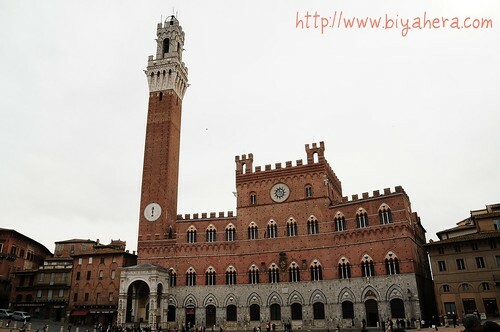 The color of the square and its buildings is a color known to Crayola users as "burnt siena." This is the St. Francis Basilica. Assisi is a town in Umbria Region of Italy. 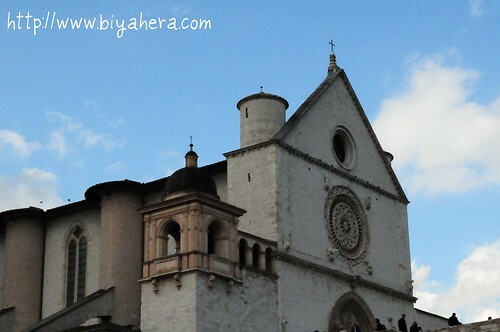 It is the birthplace of St. Francis and St. Clare (founder of Poor Clare). Above is the Leaning Tower, one of the known sights in Italy and the Duomo (Cathedral). The leaning tower is actually the bell tower of the cathedral. 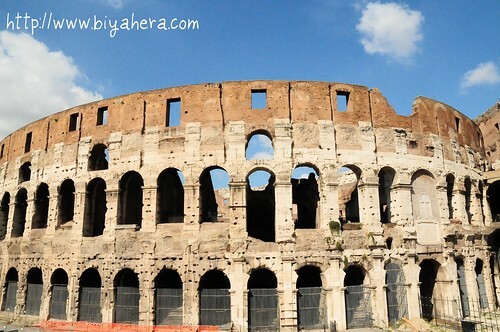 This is the Colosseo (real name: Flavian Amphitheater) ruins in Rome where gladiator contests are held. Aside from Colosseo, we also went to other interesting sites and museums. 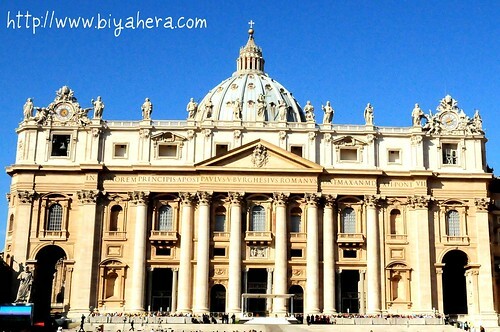 Above is the St. Peter's Basilica in Vatican City. I guess it is every Catholic's dream to visit Vatican. We also visited the Vatican museum and Sistine Chapel and attended the papal audience. Which of the places above would you like to visit? We're flying tonight. So many things to post but I'm afraid they have to wait until I return in two weeks. Happy Eid to all!!! Re-issuing tickets used to be free unless the airline have specific restriction and payment by credit card has no surcharge. If the company is providing tickets, individuals will not be affected by the charges; but those receiving airfare allowance can save some bucks by booking tickets from airline's online booking facility. This will avoid the 7% service fee and will save a significant amount of money especially to those travelling with their families. But there are drawbacks too. Online booking requires instant payment through credit card and the traveller has to use his own card because it is required to be presented during check-in. One more thing, having an e-ticket can be a hassle in NAIA. Read my husband's experience here. Do you book your tickets online or through a travel agency? Great news for Europe travellers who are required to obtain Schengen visa to gain entry in Schengen States of Europe. As of 21 December 2007, additional nine new countries became part of the Schengen travel area including Czech Republic, Estonia, Hungary, Latvia, Lithuania, Malta, Poland, Slovakia and Slovenia. This means tourists can extend their borderless travel to nine more countries with just a single visa. Prior to the 2007 expansion, the existing fifteen Schengen states were Austria, Belgium, Denmark, Finland, France (Monaco is treated as part of France), Germany, Iceland, Italy, Greece, Luxembourg, Netherlands, Norway, Portugal and Spain. However, UK and Ireland still maintain boarder controls and are not part of the Schengen visa. Happy Travelling and enjoy Europe! I have already visited 14 countries or 6% of the world. I sure need a lot of catching up. LOLs!!! During our recent trips, I didn't have any problems with Qatar Airways e-ticket. But they sometimes ask for the credit card used in buying tickets. Qatar airways do not issue paper ticket anymore. If you plan to fly with Qatar Airways, you can book tickets directly from their website. In my previous entry, I talked about the convenience of booking tickets on-line. The round trip airfare I purchased from Travelocity for someone else, didn't have any problems. The person was able to come and exit Qatar smoothly. If he comes back in December as planned, I will again book and purchase tickets online. However, my husband had a different experience. When we booked the ticket at Qatar Airways, we knew that he has to present the credit card used for online payment. This requirement is rather unusual. This means you cannot purchase a ticket online for someone else like what I did above. But then I guess, this is to prevent fraudulent credit card transactions. My husband didn't have problems during check-in at Qatar Airport. However, at NAIA, he was required to produce a valid ID other than his passport. Then, he had to wait because the counter staff had to photocopy his ID somewhere in a remote corner. This extra step delayed the check-in process. Honestly, I find the presentation of second ID really ridiculous. A passport is one of the most widely accepted form of identification. He even had an OEC from POEA. Why do they need to complicate simple things? It's clear in the Qatar Airways website that credit card used to purchase the ticket must be presented. I think, a second ID and photocopying are over-kill. Booking online is supposed to provide convenience but if the check-in process will be complicated, I wouldn't book my ticket online for our next trip. I wasn't even thinking of flying Qatar Airways. I'm just not satisfied with the service ( aside from online booking problem). I don't think they are a five star airline as they claim to be. If you visit United States (as non-immigrants), you will be issued I-94 card. This I-94 card must be returned upon leaving United States, otherwise your departure will not be recorded and you will be included in the list of over staying persons. when they enter the United States. The I-94 card serves as evidence that a non-immigrant has entered the country legally. It is stamped with a date indicating how long the non-immigrant may stay for that particular trip. It is this date--and not the expiration date of the visa--that controls how long a non-immigrant can remain in the United States. A new I-94 card with a new date is issued each time the non-immigrant legally enters the United States. For more detailed information visit this site. It's a tedious process. Make sure that you return your I-94 card when leaving United States. IATA requires the whole airline industry to switch from the traditional paper tickets into eTickets by May 2008. If you've been travelling a lot lately, you will notice that most airlines are now issuing eTickets - a piece of ordinary paper that contains the booking reference and the flight itinerary. With the current available technologies and the airlines' switch to eTickets, online booking of flights is now becoming a popular alternative to the traditional booking with travel agents. Many airlines are now promoting online booking of flights. Airlines even give promotional discounts to encourage travellers to book flight online. There are also many web-based companies offering cheap airfares for various destination. These on-line facilities allow flights to be booked and paid online. In-turn, eTicket is issued to the traveller. Honestly, I haven't explored booking and purchasing tickets online much although I am a fan of Travelocity for checking airfares and possible itineraries. I've always rely on travel agents because with just a phone call, somebody will take care of our needs. But lately, I discovered some benefits of booking on-line. In his recent trip, I told my husband to try the on-line booking facility of Qatar Airways since there's no difference on the cost of the airfare anyway, whether he will book online or through an agent. Things went well and we didn't encounter any problem at all. We did everything at the convenience of our home. Then, the other day, I also booked a flight online for someone (from US) who needs to go to Doha. At first, the arrangement is we will wire the money so he can buy his ticket. But I was so shocked that his agent quoted 10,000 USD for a round trip business class ticket. This is way out of my budget and there's no way my boss will approve it. I offered him to buy his tickets. I asked around for info and I found out that my one of colleagues usually scout for cheap tickets online whenever he needs to fly someone to Doha. He also gave me tips on how to get good deals. Upon his advice, I searched at Kayak.com and found a ticket for 7,500 USD. What's good with Kayak.com is that it searches different websites and gives a summary results without the need to visit several different websites. Here are some thoughts on how to get a good deal on ticket prices and booking online vs. contacting a travel agent. I discovered that you can have a lot of savings if you fly during weekdays as opposed to flying on a weekend. Consider the peak and off-peak seasons. For instance, Summer and Christmas are considered peak season so airfare will be higher no matter what. Watch out for airline promotions. They can give you very good savings. Consider flying with budget airlines. Accumulate airmiles. It is also a good way to get a free ticket. If you are planning to go to a single destination and you have a preferred airline, you can also visit the airlines' online booking facility. The main advantage of on-line booking is convenience. You can do it at home and no need to line-up at the travel agency - which can be time consuming. It's usually book and pay. Unlike with a travel agent, you can book first and then pay afterwards. Travel agents can also put you on wait-list if there are no seats available at the time of booking. You need a credit card for payment and you may need a higher credit limit if you are booking for multiple trips or several passengers. Some websites accepts only credit card issued in the US or Europe. Check for restrictions before paying. While tickets are cheap, there can many restrictions. One thing I haven't discovered yet is how to rebook flights although for Qatar Airways and Emirates, I think, you just need to call them or visit their office. Booking online or through an agent will always have advantages and disadvantages. It's a matter of choosing which will work best for us. How about you, have you tried online booking? Do you have more tips for finding cheap tickets and online booking? When we arrived in the US, I was worried that we might be refused entry because we came from the middle east, etc. After passing through the immigration without any problem, all my worries went away. Little did I know that our departure would not be as smooth as the arrival. In fact, I would describe it as unforgettable and traumatic. For some reason, we were selected for random security check during our departure at JFK NY airport. While we were lined-up, the security officer checked our passports and boarding passes. Then, we were asked to go to the "special lane." We thought it was some kind of "fast-lane" for passengers who are due for boarding soon. But we were so wrong! It was indeed a special lane but intended for people who are chosen to undergo thorough security check. Bags were swiped with round sheets of filter-like paper and these are run through gas chromatographs. I was so scared even if I am confident that they will not find any illegal substance from our things. But, what if somebody planted some drugs in our bags? It was very traumatic! The security officer even took out the contents of my carry-on bag. This time, she was shocked to see all the shoes I hoarded during my NY shopping spree. Words cannot describe the disbelief in her face when she found at least 20 pairs of shoes from my bag. I wonder if she knows Imelda? My boss remembered Imelda when I told him what happened at JFK! Will I still go back to New York? Of course, there's no doubt about that! We're off to travel again next week and spend one month in the Philippines. We really hope to enjoy this vacation as we were away for two years. We also look forward to visit as many interesting places as we could. I have so much to write but I have very little time. I hope that in the next weeks, I would be able to share our adventures in Texas and New York. I am also hoping I would have the time to share our European adventure last fall of 2006. I know it's been sometime but I believe our experience is still worth sharing. I like travelling but I don't like long flights. Our flight to US (Doha-London Gatwick-Atlanta-Austin) took us 24 hours (including airport time). We took the 1:30 AM Qatar Airways flight to LGW where we had two hours transit time to catch our Delta flight to Atlanta Georgia. We disembarked at the South terminal and Delta is in the North Terminal, so we had to take airport shuttle to transfer. It was a long walk from the disembarkation gate to the transfer shuttle pick-up point. Two hours is just enough to get to our next boarding gate; I didn't even have time to wash my face and brush my teeth!!! Before going to the transfer desk, our passports were checked. For some reason, my supposedly machine readable visa, can't be recognized so information has to be typed-in manually. We were also informed of the one carry-on bag per person policy at the the security check. From the Delta counter, we got our boarding passes for our onward flights up to Austin. In this trip, I learned that if you have a domestic connection flight, you need to go through immigration at the first point of landing in the US. So, in Atlanta, we went through the immigration to stamp our passports. We also collected our luggage (how weird!) only to be dump again in the collection counter. I was a bit nervous at the immigration counter because we might be refused entry since we are coming from the middle east or for any other reason. Overall, it was a smooth journey except for some minor glitches. Here are some reminders to travellers with connecting flights and those transiting in London. Banning of liquid and creams started in Europe following the incident in London where liquid explosives were smuggled in carry-on bags. I think, right now, the ban is already being implemented in most airports worldwide. If you have a connecting flight, refrain from buying liquid items at Duty-free store because during transfers, security checks wouldn't allow any liquids even if you bought it from the duty-free shop in your previous flight segment. It's good, I didn't buy any liquids from Doha Duty-free, otherwise, they would probably be confiscated. In London, they also require make-up including pressed powder, lipstick, etc. to be in a resealable transparent bag. London Airport allow only one carry-on bag per person. I repeat - just one! Otherwise, you'll have to check-in one of them. I am really surprised because I never heard of this requirement in any other Airport. We were not informed about this when we checked-in in Doha. We had a little problem because I have two bags - my laptop bag and my personal bag, which is normal for passengers bringing their laptop. Obviously, I cannot check-in any of my bags. Another problem is I bought some sweets from Doha duty-free so I had a third bag. It's good that my husband used his trolley-type carry-on bag with laptop sleeve so he only had one bag (Yep, we bought two laptops). We had to re-arrange our stuff to fit everything into two bags. Be prepared to remove your shoes, belt, coins, coat, watches every time you go through a security check. All these are passed through the x-ray. Laptops are also required to be taken out of the bag. When we applied for Schengen Visa last year, we were required to purchase a travel insurance. I found out that it's very affordable with very good benefits. This time, I also purchased a travel insurance. The cost is $40 valid up to to 20 days. If travelling elsewhere, the cost of travel insurance is $30 for the same duration. The insurance will cover medical expenses incurred while travelling and repatriation in case of illness or death. It may sound morbid it's better to be prepared for unforeseen circumstances. I lost my card wallet (I really don't know if I lost it or someone took it from me) when we went to Paris in 2006. Being a card wallet, it contains all my local credit cards and identification cards in Qatar. It was a disaster. I had to spend for overseas calls to cancel those cards and the replacement fees - I don't want to remember anymore. The time and effort required to personally fill out and sign forms - I surely learned my lessons. To avoid similar incident, I'll only bring the necessary cards. Definitely, I'll bring a credit card but I don't see the need to bring additional identification cards other than our passports. I find the use of credit card to be very convinient in settling hotel and other bills plus I don't like bringing a lot of cash with me. However, I'll make sure that this time my credit card and cash will be secured throughout our trip. We haven't started packing yet. I am not planning to bring a lot of clothes as I plan t o shop there. Let's see what happens. While my goal is always to pack light, I always end-up with more stuff than planned. I haven't really planned anything but I listed all the attractions I want to visit. I'm not sure how much we can cover in a week's time but I hope to see as much we could! I'll keep you posted about our adventure. We are off to US in a few days. Our point of landing is Austin, Texas where I'll attend a symposium in Leak Detection and Repair (LDAR). My husband has his own plans but has not finalized anything yet. He is supposed to visit a colleague in Houston and he might visit their parent company's petrochemical plant, also in Houston. He is also crazy about NBA and he is hoping to have an opportunity to watch a game. I'll be in the symposium for three whole days so I don't have much chance to go around Austin and honestly, when I did a little research on the net, I didn't find anything interesting or any famous place/ landmark which can be considered as a "must see" attraction. My colleague told me that there's really nothing interesting in Austin but it would be good to visit and go around Texas A&M University. Now, that's interesting - I'll definitely visit Texas A&M. My boss told me to also visit Alamo but it was in San Antonio!- 2 to 3-hour drive from Austin so chances are - I won't be able to. I'm interested to visit the NASA Space Center, which is in Houston. Now, that needs planning - maybe I can meet my husband in Houston on the 4th day, which is a free day for me. But most probably, I'll just stay in Austin and content myself with whatever attraction they have. From Austin, we'll fly to New York to visit my friend Jo Anne. I haven't done any research on New York but I bought a Travel Guide, which I haven't read yet. I am planning to go through it in the plane while enduring a long and boring flight. This will be the longest flight in the history of my travel and I really get cranky during long flights and it makes me sick at times. Hmmmm....I'm excited about New York because I'll be seeing my best friend after two long years. In the history of our more than two decades of friendship, this is the longest time we've been apart from each other. Aside from seeing her (and her husband) and visiting "must see" attractions in New York, I look forward to do shopping with her as we always did in the past be it in the Philippines or in another country. I'm really excited! I promise to give you more updates later. Our application has been approved! I already got our passport (stamped with the visa) today from the US Embassy. I'll be attending a training and symposium in Austin, Texas and I'll take this opputunity to vist my best friend in New York. Walter is also joining me in this trip. The application process was fairly simple and the step by step procedure is published in the US Embassy website. The real challege is to convince them that we will come back to Doha or to the Philippines after our US visit - which we were able to! To those who are currently holding a resident permit in Doha and whishes to apply for a US visa, information below may be helpful. Also visit the US Embassy website for more details. 1.) Fill out the on-line application (DS 156) and print a copy after online submission. Then save the file for refrence. This application shall be submitted to the embassy during the interview. 2.) Fill out the supplementary form (DS 157) (hand written) and attached to the printed application (DS 156). 3.) Pay the QR 365 ($100) fee at any Commercial Bank branch in Doha. The bank will return the second and third copies of the bank slip: one for the applicant and one for the US Embassy. They are also supposed to issue a separate receipt per applicant. Note: Make sure to bring the passport of all the applicants. Commercial bank will not allow you to pay unless the passport is presented to ensure that names are spelled correctly. Passport (at least one year validity) and old passports (if available) to show the previous countries visited. Letter from the company stating the the job title, basic monthly salary, and length of employment and the purpose of their visit to the United States. Company profile (I worked for an American Company so I figured this maybe helpful if they asked information about my company). Approved training request from my company. 5.) Have your photo taken. The Embassy has a specific photo requirements. Make sure to have your photos taken at the recommended studios. 6.) Make an online appointment for the interview. You will be required to enter your passport number, the barcode number of the application and the Commercial Bank payment receipt number. Make sure these information are readily available when making an online appointment. Right now, there is an on-going construction in the US Embassy Area. The traffic is unpredictable and the main route to the US Embassy is closed. I will advise applicants to try driving to the US Embassy before the scheduled day of interview to be familiar to the possible routes. Obviosuly, we got lost!!! It's good that my boss was kind enough to get me his Embassy's number while helplessly finding the right way. It will be helpful to keep the US Embassy number handy and if you get lost too, do not hesistate to call the Embassy to ask for assistance. When you get to the embassy, the security will give you a number and direct you to the waiting area. The applicants will be called in batches of 5, for verification of the document. If the document is already complete, a stub will be attached to the passport and you will be asked to proceed to the first security check. The bags will be inspected thoroughly including make-up kits, etc. Do not bring too many items, which you do not need inside the Embassy. They will also take the mobile phones during the first security check. Then, proceed to the consular office. Here, there is another security check before you can come in. Go to Window 1 to submit documents and wait for your turn. Before starting the interview, they will get the index finger print (left and right). The questions are really simple and easy to answer, unless you are hiding something. If the application is denied, they will inform you right away and return your passport. If approved, they will give you stub with the date and time when to collect the passport with the visa. That's it! As I've said, the procedure was simple but approval can be tricky. I'll be in Austin from June 4 to 9 and we'll visit my best friend in New York before going back to Doha. As usual, I'm already excited!